Could this lottery winner story end in financial tragedy like many others? Or will this be a rags-to-riches story of a man who made the most of his unlikely win? 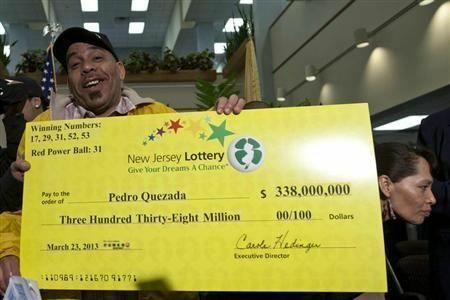 Pedro Quezada, who just recently won the $338 million Powerball jackpot, has decided to take the lump sum of $221 million ($152 million after taxes) and, according to the New York Daily News, has pledged to pay the rent of everyone in his neighborhood for a month or two. Quezada will also reportedly appear in court Monday for $29,000 worth of unpaid child support, which he can now easily cover. He’s the father of five children, ages five to 23. Image via the Associated Press. Deadbeat dad that's now going to squander tons of money paying other people's rent. Naw, this won't end badly. I'm sure the next thing he'll do is hire a financial planner an have his money work for him. Like it or not, with the legal predicament (whatever the cause) comes a label. Glad to see he's made his kids whole and is now helping his community. I can't imagine the whole neighborhood's rent for a month or two amounts to much more than a few hundred thousand (out of $152 million). As for the future, if I was on the other side of his child support matter, I'd be after the guy for a child support/college trust just to make sure that, if he does end up squandering it all, the kids are still well-provided for. Not sure I'd mind that approach, myself, and as good as this guy seems to be feeling right now I can't imagine he'd be completely unamenable to the idea. (FTR, I have no kids at all, let alone from a former relationship of any sort...THANK GOODNESS!). If he lives near low income housing like the projects or something then everyones rent might be 2 or 3,maybe 4- THOUSAND!!! thats about it.Subtract that from $152 mil and he can still live pretty comfy after that. Wait until he finds out how child support actually works. Now that he has 152 million the woman/women that he fathered children with will be able to get their payments adjusted. Whatever he pays now will pale compared to what he will be forced to pay. If you look at the total that a lot of athletes have had to pay... Rodman... T.O.... they were paying as much as 50k per month... they were not worth 152 million. He had better hope these women don't have savvy lawyers.